Milton Keynes IT Support and technology services company, Mirus IT Solutions, has been named in a new report to identify the best performers in Buckinghamshire. The report, called Buckinghamshire Limited, has been compiled by financial and business advisor, Grant Thornton, and details growth and profitability results across the region. The survey analysed the financial performance of the county’s leading privately owned companies to provide a yardstick against which the country can assess its economic performance and business can benchmark against their peers. The report also demonstrates the capacity and capability of the local economy and provides signals on the recovery from difficult trading conditions and the future potential of this economy. Buckinghamshire Limited is compiled using the most recently publicly available accounts (as of June 2013) of the county’s 100 largest privately owned companies based on turnover and with their principal trading address in Buckinghamshire. Mirus IT has been recognised as one of the ten Technology firms in the report, which notes the highest average annual salary, reflecting the ‘value add’ delivered by highly skilled employees. 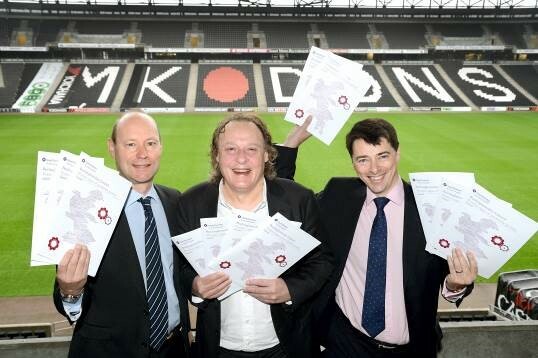 (L to R) Mike Hughes, Director at Grant Thornton, guest speaker Pete Winkelman, Chairman of MK Dons and David Newstead, Partner at Grant Thornton, launch Buckinghamshire Ltd.